Black as night, this coffee stout is thick, rich and full of real coffee flavor. 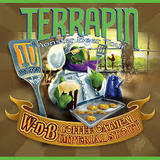 Brewed with a special blend of beans from all over the world developed and roasted specifically for Terrapin by our friends at Jittery Joe’s Coffee right here in Athens, Ga. This unique blend of coffee produces a robust and flavorful beer that will leave you asking “Why not Beer?” for breakfast!